A partial correlation measures the strength of the linear relationship between two variables, while adjusting for the effect of other variables. The following statements request a partial correlation analysis of variables Height and Width while adjusting for the variables Length3 and Weight. The latter variables, which are said to be "partialled out" of the analysis, are specified with the PARTIAL statement. Output 2.9.1 displays descriptive statistics for all the variables. The partial variance and partial standard deviation for the variables in the VAR statement are also displayed. When you specify a PARTIAL statement, observations with missing values are excluded from the analysis. Output 2.9.2 displays partial correlations for the variables in the VAR statement. The partial correlation between the variables Height and Width is 0.25692, which is much less than the unpartialled correlation, 0.92632 (in Output 2.9.2). The p-value for the partial correlation is 0.1558. 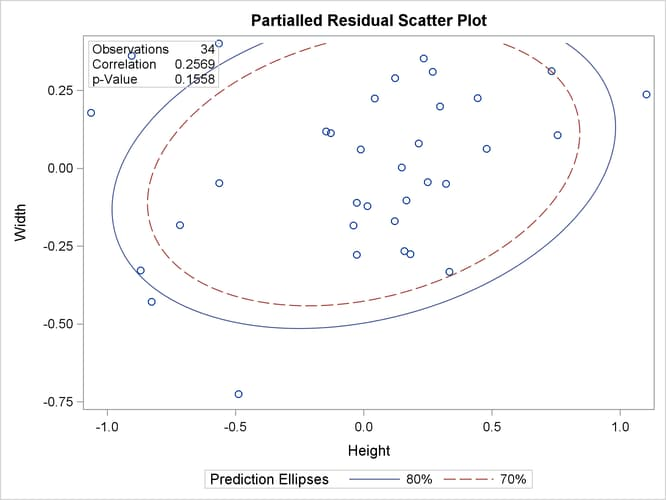 The PLOTS=SCATTER option displays (in Output 2.9.3) a scatter plot of the residuals for the variables Height and Width after controlling for the effect of variables Length3 and Weight. The ALPHA=.20 .30 suboption requests and prediction ellipses, respectively. In Output 2.9.3, a standard deviation of Height has roughly the same length on the X axis as a standard deviation of Width on the Y axis. The major axis length is not significantly larger than the minor axis length, indicating a weak partial correlation between Height and Width.